As many of you know, I was born and raised in Moscow. And each autumn, us kids were eagerly waiting for the rowanberries to appear. We’d run to the birch groves and beyond to pick the big, light berries, that would seemingly have appeared overnight, ablaze, hundreds of glowing dots, much like will’o’wisps, magically caught in the branches. We’d put the berries on strings that we’d tie around our shoulders and, later, run home happy, laughing, each of us bejewelled with several bright orange bead chains – a swarm of shrieking wild birds. At home, mothers and grandmothers would make jam, and we’d jump around them, get in their way, try to steal a spoonfull of the hot, tangy, dark orange sirup, knowing the berries were not good raw… …If you’ve followed BEAUTYCALYPSE, you’ll remember my review of one magical place in Berlin called Du Bonheur. Well, huge thanks to Anna and Stefan for bringing back happy childhood memories! 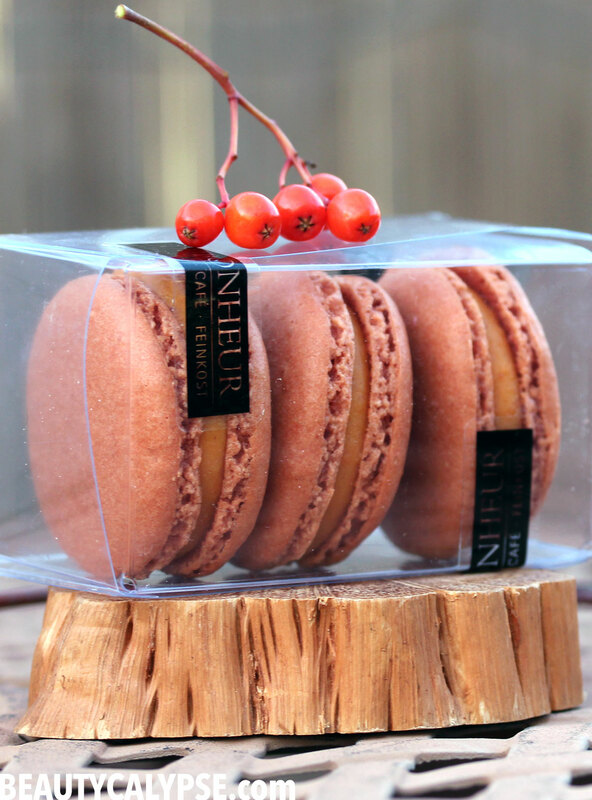 You see, in autumn, the Du Bonheur rowanberry macarons appear and are a real sellout, quite literally so: once the berries are finished, it’s “see ya next year”. Spotting the rowanberries there again has reminded me of this wonderful, healthy berry that’s still unforgivably rare on our tables and yet so widely known and loved in some places. 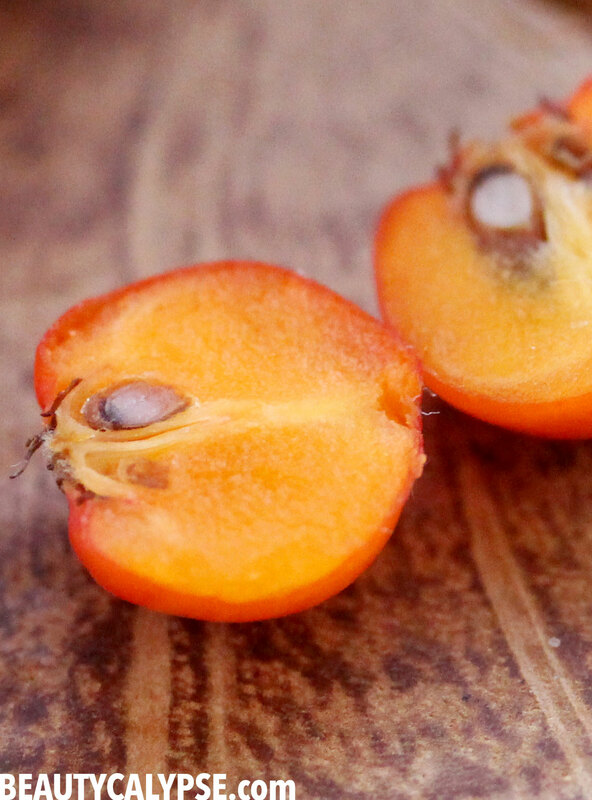 As a green lifestyle blogger, I probably could focus on the health benefits of these ardent little power berries only, but as a mythology geek, I LOVE the rowan tree lore and I believe that you’ll appreciate it as well, Halloween or not. Interestingly, the European rowan (the most widely known edible species being Sorbus aucuparia) is found throughout all of European folklore. According to Greek mythology, malevolent demons stole the magic cup from goddess of youth Hebe, and the gods sent an eagle to get back the precious cup. Whenever a drop of that eagle’s blood or his feather touched the earth, a rowan would grow. 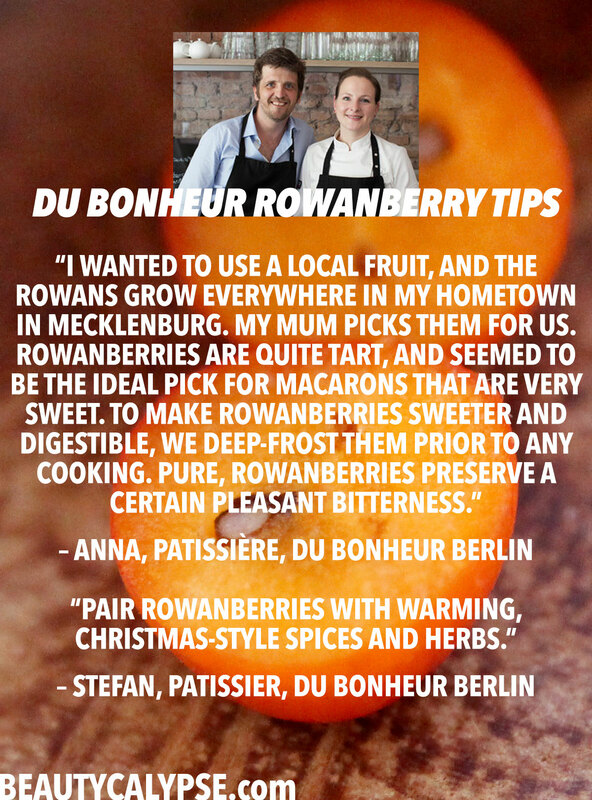 Such a poetic description of the unique shape of the rowan’s leaves and berries! Known as the “wayfarer’s tree”, the rowan was believed, in many countries from Russia to Britain, to give protection and to safeguard travellers from getting lost or cursed in those long gone prae-GPS times. In Nordic lore, it’s Thor’s tree. In Scotland and in Ireland, rowans were thought to protect against witches and all kinds of sorcery. Mythical and beautiful, rowans are a perfect decoration for the season of the witch – and remain a lovely garden plant throughout the year (for all-year witch protection, of course 😉 )! 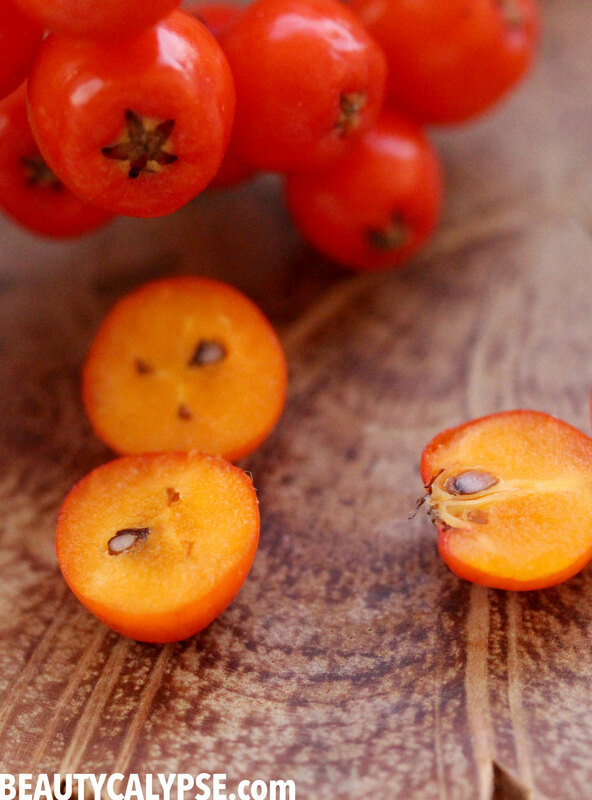 So, rowanberries make for an amazing Halloween food: they’re bright orange, they’re super versatile, and they’re really healthy with a distinct, tangy, “adstringent” taste. However, there are edible and not-so-edible cultivars, so better not just go pick them in the park if you can’t tell the one from the other 😉 If this is the case, better get ready-made rowan berry preserves and jams. 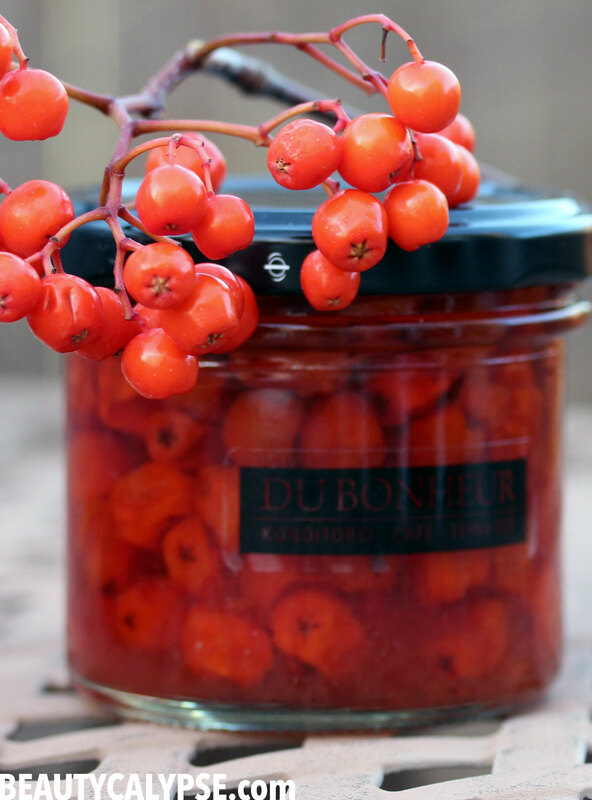 Rowan berries are not good nor particularly delicious eaten raw due to the high content of parasorbic acid, but they’re excellent in preserves, jams, even berry wine – parasorbic acid turns into healthy sorbic acid when the berries are treated with frost and heat. 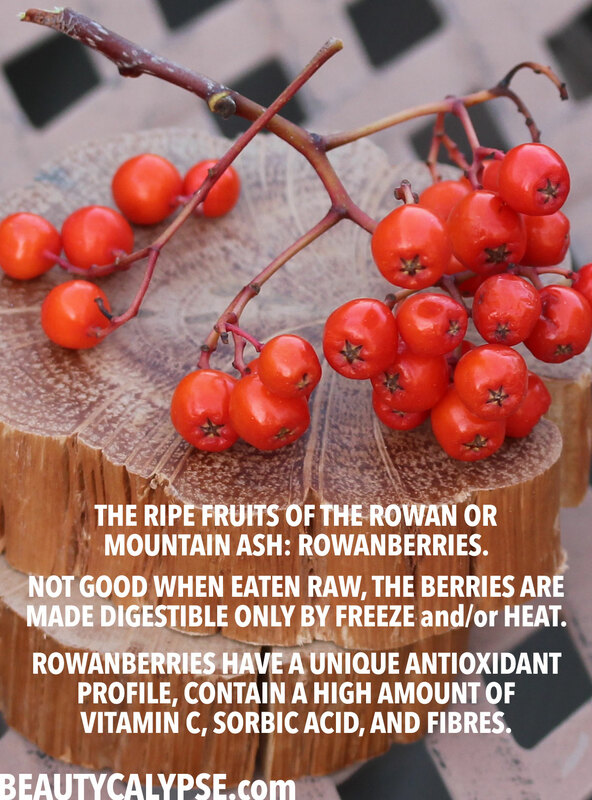 Vitamin C content in rowanberries is particularly high; up to 100 mg per 100 g – of course, cooking destroys ca. 30%, but still, impressive. 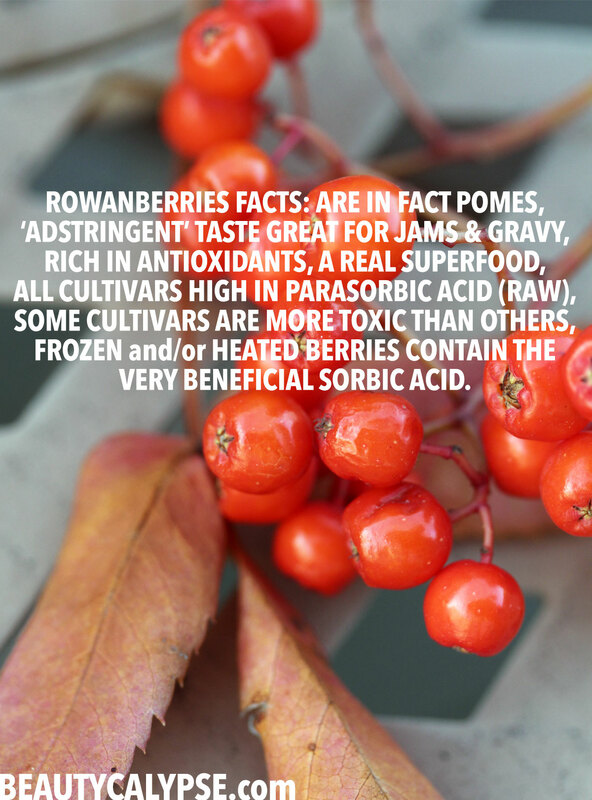 Rowanberries further contain high amounts of fibres and carotenes. Rowan berries are gently bitter and “bright” – or so I try to describe their light, delicate, sunshine-in-your-mouth kind of taste – when cooked right. If you pick berries before the first night frost hits, put the washed loot into the freezer for about 12 hours. This will help transform parasorbic acid (not good) into sorbic acid (good). Then, proceed to your liking: press the berries to obtain juice that you can either add to drinks as is or cook sirup from; dry the berries to make berry tisanes later; pickle the berries or cook jam; adventurous folks even make berry wine from rowanberries – this I am yet to try. I know they make rowanberry wine in Hessia, the home of Germany’s best apple wine, so if one of my green travel trips will take me there, I’ll report. Quality rowan trees for your garden are available at €30 per tree (60-90cm) via the Manufactum online store. and future are tagged BEAUTYCALYPSE Halloween. я не зналa что ты из Москвы. Did I? It’s no secret about Moscow, but I just realised that it dropped out of my about me copy as I was editing it this summer – oooops. А ты русский знаешь? !